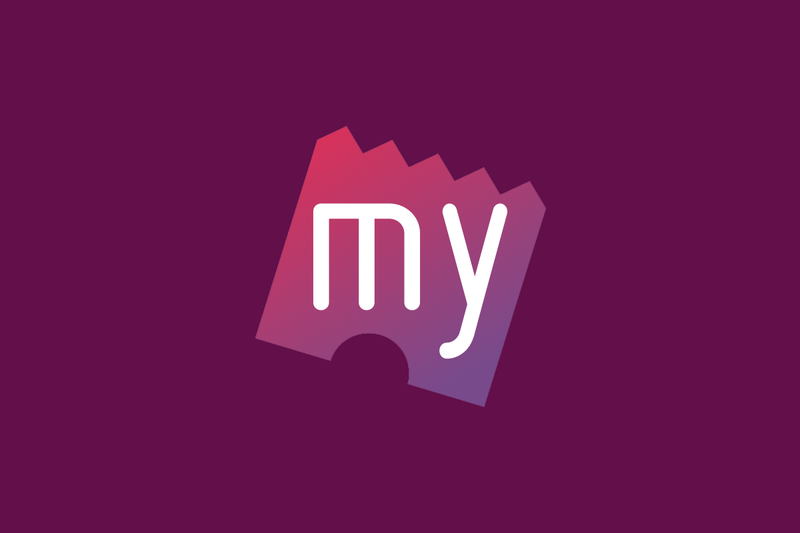 BookMyShow is one of the popular online movie ticket booking app in India, and today it got an update to v5.0.7 with a major overhaul. The app now improves discoverability, adds various language support, mini maps, split tickets and more. In the new update the app now lets you choose preferred movie by filtering them either by language or by cinema. 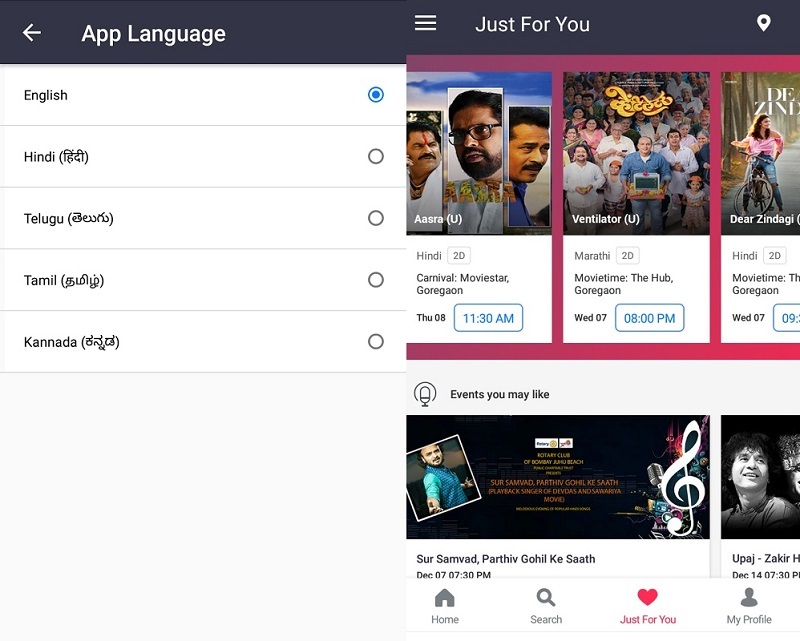 With the latest update, the app adds support for four more languages viz Hindi, Telugu, Kannada and Tamil. There is also a new feature which is called Mini Maps, it offers a bird's eye view of the full layout of the premises while selecting seats during booking tickets. The update introduces Just For You feature which learns from the user's past purchase behaviour, understands their choices and recommends personalised suggestions with relevant entertainment options. Although the booking flow for events and movies is same, the update has reduced number of booking steps as users will now be able to choose from different categories and price points within the same screen. Along with a new UI, the update also adds a new feature called Split Tickets, which lets you instantly share tickets with the entire movie going group. It will split the cost between all the moviegoers who can then pay for their share using My Wallet. 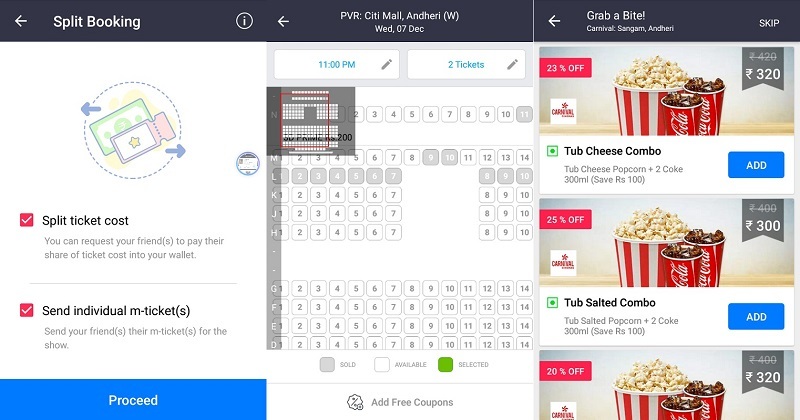 Moreover, users can now pre-book food and beverages after successfully completing a movie ticket transaction on the app. When we decided to make so many new additions, we were cognizant of the booking process getting complicated or the app looking too heavy and cluttered. This is why we decided to completely rebuild the app from the start, give it a total facelift while making sure that it is designed to gradually influence interaction behaviour on our platform. The new app is fully loaded with never before features. A lot of these are a direct result of user feedback that we have received over a period of time. We have added more native advertising space in the app which is far more impactful yet non-intrusive. At the back end, the app architecture has been kept flexible to enable us to keep adding more features to it in the future. The update has been rolled out to Android users and will be available for iOS soon.